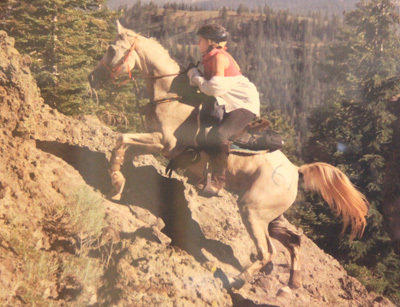 Lisa Bykowski and PL Mercury on Cougar Rock in 2010 when he tied as the oldest horse in the Top 10 to complete Tevis at 19 1/2. 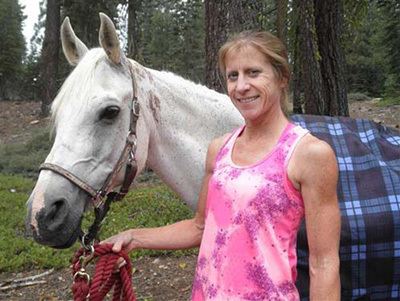 This July, Claire Godwin, DVM and Lisa Bykowski of Laytonsville and their horses EH Ahmose+/ and PL Mercury headed to Auburn, California to test themselves at the 60th Western States Trail Ride, more commonly known as the Tevis Cup. Tevis is considered by many to be the toughest ride endurance has to offer. Covering 100 miles of hard-packed soil, loose rocks, steep hills, low canyons and even a swinging bridge, riders and horses need to be fit and a bit fearless. An average year has a completion rate of 50%; this year there was a completion rate of 45% with 198 starters. This was the second trip to Tevis for Claire and Lisa who finished sixth and fifth, respectively, in 2010. This year, they finished 15th and 14th, respectively. Tevis statistics show several horses completing the ride multiple times with more than 100 riders competing each year. What stands out about this Maryland group is the little grey Arabian, PL Mercury, who at age 24 was the oldest horse to start this year, not only completing the ride, but finishing in the top 20. Mercury had previously been a show hunter and Pony Club mount when Claire Godwin responded to an ad in The Equiery in late 2005. Looking for a pony for her son Dan to ride, she went to look at the Maryland-bred Arabian. PL Mercury was bred by the Players of Playland Farm in Union Bridge. He was advertised as a 14-year-old, 14-hand kid’s pony, and seemed to be safe. “He had straight legs and big feet,” recalled Claire. Those attributes are important in an endurance horse and they sealed the deal. Once back at the Godwin’s farm, Claire’s daughter Katie claimed him on first sight because of some freckles forming a heart on his left shoulder. Soon after his arrival his endurance conditioning started with time on the trails, and he loved it, working up to six to seven miles two to three times a week, with a ten to twelve mile “serious” work once a week. 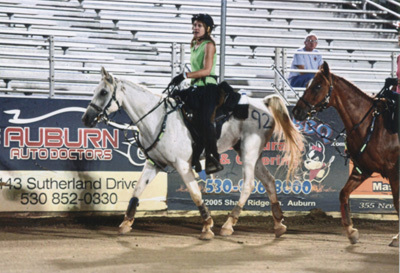 Mercury’s first competitive ride was 55 miles in March of 2006, which he completed with Katie on board. 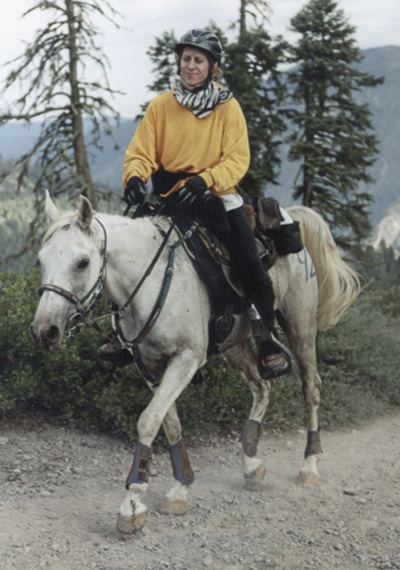 He had seven more 50- or 55-mile rides that first year, completing five of them, and finishing in the Top Ten once. In 2007 Mercury started seven rides and completed five, finishing Top Ten in three. Claire then took over the reins from Katie in 2008, and he seemed to hit his stride, completing all 10 rides he started and finishing in the Top Ten eight times. He won three in a row; Western Maine Pioneer II-IV 55-mile, Western Maine V 50-mile two days later, and two weeks later, Peace Point Endurance Ride 50-mile where he also won Best Conditioned. The Best Conditioned award is often more coveted than a first-place finish. The award is determined by combining speed, weight carried and vet scores. Another Best Conditioned followed three weeks later in September with the Big South Fork Pioneer 50-mile. By 2008 Mercury had proved himself such an easy horse to ride that he was often loaned to other riders when they found themselves horseless for one reason or another. He has had a total of 11 riders in his nine-year career. But he was becoming best known for his consistency. This consistency has earned him the nicknames of Mercules and Merctastic. In 2009 he finished Top Ten six times out of 10 starts. He also competed in his first 100-mile ride at The Biltmore (12th place) which was just a warm-up for his first trip to Tevis. There, loaned to another rider, he finished 44th at 18 years old and with only three years of endurance experience. In 2010, he finished Top Ten in all ten rides started, including his sixth place Tevis finish with Lisa on board. He is tied for being the oldest horse to Top Ten at age 19 and a half. Later that year he earned another Best Conditioned award. “The Little Engine That Could” earned Top Ten status at ten out of thirteen rides in 2011. He was also Best Conditioned and won at Top of the Rock 50-mile that same year. 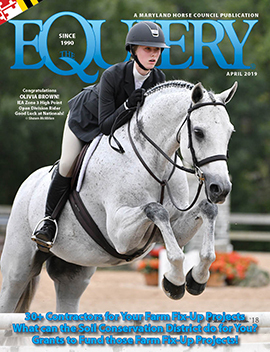 In 2012, junior rider Wesley Taylor of New Jersey took over some of the riding duties and he continued to consistently place in the Top Ten. That trend continued into 2013 and 2014. In his 2015 season, Mercury has earned Top Ten in every ride except Tevis. He finished fifth at Old Dominion in June. The Old Dominion 100-mile is considered the hardest East Coast ride and he has completed it twice. More than his consistency, his age has earned him quite a few followers. Lisa reports that they were cheered on at Tevis by spectators and volunteers alike. Many people are inspired by his toughness, keeping their seniors working instead of retiring them. Mercury started his endurance career at 15 years old, an age where a lot of horses are retiring or having their work load cut back. He is proof that age is just a number. To sum up this amazing little guy’s career: he has completed every 100-mile ride he has started. He has a total completion rate of 94%, amassing a total of 4565 miles in nine years, six Best Conditioned awards, 51 Top Ten finishes and 83 completions. Claire has no plans to retire Mercury as long as he wants to go and she feels he is up to it. So what is next for this little guy? Claire plans to start him in the AERC Championships this October in Fort Valley, Virginia. If he completes those 100 miles, he will have completed the endurance “Triple Crown” (Old Dominion, Tevis and the AERC Championships). In a sport whose motto is “to finish is to win,” the little 14-hand, 24-year-old is a real winner.